Photo: J. W. Gerber House, ca. 1901, 24 West Main Street, Luverne, MN. Listed on the National Register of Historic Places in 1980. Photographed by user:McGhiever (own work), 2012, [cc-by-3.0 (creativecommons.org/licenses/by/3.0)], via Wikimedia Commons, accessed May, 2014. The Rock County Courthouse is located at 204 East Brown Street, Luverne MN 56156; phone: 507-283-5060. Rock County borders Iowa and South Dakota in the southwestern corner of Minnesota in the prairie part of the state. Rich loess soils provide some of the best farm lands in Minnesota. The most outstanding physiographic features of the generally smooth to undulating surface are quartzite outcrops, steep escarpments bordering glacial out-wash stream beds, and the Rock River that runs north-south through the central part of the county. Blue Mound State Park, a large outcrop of Sioux quartzite, rises 200 feet above the land surface, providing the greatest local relief in that part of the state. Tallgrass prairie once covered the county. Trees were found only along stream beds. Rock County settlement lagged behind other regions of the state. The first effective, permanent settlement was at the site of Luverne, on the Rock River, in 1867. When the county was organized in 1870, the population was only 138. County organization, completion of the government land survey in 1871, and railroad construction late in the decade, led to more rapid settlement. After a few years of stagnation due to drought and grasshopper plagues, Rock County grew rapidly. By 1880 county population was 3,667. The growth boom continued until 1900. Since then growth has leveled off. In 1970 the population was 11,346. Population growth and distribution reflects the density of development. The rural areas and most of the smaller villages have declined slightly from their peak years. Luverne, the county seat, has continued to grow and increasingly gains over the rest of the county in its share of the county population. Railroads spearheaded settlement in Rock County. Railroads provided transportation to markets to the east. Two railroads, the Southern Minnesota and the Sioux City and St. Paul, were granted alternate odd-numbered sections in all of the county except portions of two southwestern townships and some previously settled land along the Rock River. The grants were made by the state as inducements to track construction. These massive landholdings and the lack of previous settlement allowed the railroads to become the major townsite planners and settlements promoters. The Worthington and Sioux Falls branch of the Sioux City and St. Paul, built from Worthington to Sioux Falls from 1876 to 1878, was the first railroad in Rock County. At that time Luverne, platted by P. J. Kniss in 1872, was the only town in the county. The railroad passed through Luverne and platted the town of Beaver Creek (1877) on land donated for that purpose. In 1880, the Doon branch of the SC & SP was completed from Luverne into Iowa. Ash Creek (1883) was platted by James B. Close, acting for a large landholder connected with the railroad. Kanaranzi (1885) was platted by the Cedar Rapids, Iowa Falls, and Northwestern Land and Town Lot Company, associated with the Burlington, Cedar Rapids, and Northern Railroad, which ran a line through the county in 1886. From 1888 to 1889 several small branch lines crossed corners of the county — the Sioux City and Northern, the Cherokee and Dakota, and the Willmar and Sioux Falls. Railroad townsite companies platted Steen (1888), Hills (1889), and Manley (1889). A private developer laid out Bruce (1888). The last rail line to enter the county was an addition to the B, CR, & N, built in 1900; Kenneth was platted by the railroad that same year. Two towns platted by individuals post-date construction of the railroads on which they are located: Magnolia (1891) and Hardwick (1892). There have been no "inland" towns in Rock County, nor any "paper towns" filed in the courthouse. While town creation was always rail oriented and most often railroad controlled, town growth was a result of the developing agricultural economy and town functions as agricultural service centers. Population change, both urban and rural, has largely been a result of agricultural prosperity and development. Rock County is on the western edge of the Corn Belt. Crops have changed since the early settlement. Wheat, the only crop that offered an appreciable cash return, was the principal crop in the early years. In 1877 Winchell, the state geologist, reported that "the main material product of these counties is now, and will always remain, wheat, of which they will produce as much to the acre as any county in the state." But by 1910 corn had replaced wheat as the leading crop. It remains the major crop today, with soybeans second. Wheat has disappeared. By 1940 the trend was set when the W.P.A. guide noted that Luverne was "made prosperous by creamery, livestock, and grain cooperatives." Today over 70% of the farm income is derived from the sale of livestock and livestock products. Western feeder cattle make up a large portion of that income. Man has dramatically altered the original prairie landscape. The dominant features of the cultural landscape are the township and range survey system, farms and farmsteads, towns, and the transportation system. Survey system — The township and range survey system forms tangible patterns on the land. The mile-square grid survey was antecedent to Rock County settlement. The survey was developed to tie land to a national grid, to ease ownership descriptions, and to facilitate settlement. The system was well suited to the relatively flat terrain of Rock County. The survey grid forms an overall context and frame for other cultural features. Farm and field sizes, road locations, town siting, and the county political boundaries, are all oriented to the grid. Farms — Agriculture is the primary activity whether measured by land use or income. The 305,500 acres in 1,105 farms, comprise 98% of the land area. Average farm size is 276 acres. The modal farm type by income is livestock operation. These are feedlot operations and are confined to small areas of the farms. Most of the farm land is cropped. Fields and farms are large; farmsteads are small and compact. All are set into the compass oriented survey system. Tree windbreaks protect the farmsteads on the north and west sides. The treeless prairie has become a series of L-shaped wood lots that often obscure the farmstead buildings. Technological advances in farm machinery have led to larger farms, increased specialization, and farmstead abandonment. Old farmhouses are left empty or whole farmsteads are bulldozed to clear more land for crops. Towns — Of Rock County's eleven platted town sites, Bruce has disappeared altogether, Manley is only a crossroads store, and Ash Creek is a single street of residences. The other eight towns have the look of urban places. All have north-south oriented grids, fitting into the township and range survey network, and clearly defined limits. The small-town plats reflect the importance of railroads in the town settlement of the county. Main streets, distinguished by narrow commercial lots and wide streets, form T-junctions with the railroads, intersecting at the depot location. The cardinal direction oriented grids and the angled location of railroads often form trapezoidal lots along the tracks. Depot grounds, wide railroad rights-of-way, line the tracks for the length of the original town plats. Towns were most often platted within quarter-section lines; section line roads rarely passed through the towns. Today one sees H-shaped towns with main streets connecting the railroad and highway. Commercial lots disappear within a few blocks of the track. Building patterns still reflect the depot oriented development of Main Street. Commercial buildings often fade out even before the commercial lots. Two town plats do not follow the T-pattern. Luverne's railroads are relegated to the outer edges of the original town. Magnolia, platted late in the county's history of town establishment (1891), has the oldest style of town plan. Commercial lots face the tracks from both sides. Actual town development, however, followed the T-plan. Commercial establishments line a street between the depot and the highway, and only do so on one side of the tracks. The smaller villages serve as agricultural trade centers and shipping points. Grain elevators, small businesses, and modest residences form Rock county's urban landscape. Industrial and storage facilities, grain elevators, lumber yards and farm equipment lots line the tracks. Most commercial establishments line Main Streets. Improved transportation and the increased use of cars and trucks have led some businesses to locate on emerging highway strips within the towns. Residences, churches, and schools are located away from Main Street on side streets. Luverne, the county seat, is by far the most important town. In addition to agricultural services, it provides full retail shopping and county government functions. Interstate Highway 90, passing south of Luverne, has given rise to a major strip development of motels, restaurants, and service stations. Rural, dispersed businesses are virtually non-existent. The separation of town and country is quite distinct. Transportation — Farms and towns are connected by a system of state, county, and township roads. The road network, almost without exception, follows the section lines. Roads form a neat one-mile square grid. Nearly all section lines have roads. Direct town-to-town road connections are rare; those that do exist follow rail lines. The survey system road network is a dominant feature of the landscape, whether viewed from the air or from ground level. Survey offsets create T-junctions for most roads at the northern and southern county boundaries. No correctional offsets were necessary on east-west roads. Hence the road network makes some political boundaries more evident than others. The railroads do not follow cardinal directions. Often established to connect cities outside the county boundaries and predating Rock County towns, the rail lines follow the shortest distances and easiest grades. Rail abandonments have changed the system connections but have done little to alter town morphology or function. Most rural abandoned tracks have been obliterated for fields. Rock County buildings reflect past investments in construction, changing fashions, and available building materials. The earliest settlement structures, built of sod, dugout, and log construction, have virtually disappeared. These early types of buildings were never very numerous. The railroad brought with it lumber shipments from the eastern forests of Minnesota. Frame buildings are dominant. Two of the earliest extant structures, the Worthington and Sioux Falls Freight Depot (1876) and the Close Brothers Tenant House (1883) are of simple frame design. Most buildings reflect contemporary fashions and modest investments. A great number of farm and town residences are "Corn Belt cubes," two-story, square houses with pyramidal roofs. Many town residences are plain bungalows. These simple styles are significant in the county but are so numerous as to preclude selection of particular examples. Luverne has a number of houses that approach "high styles:" a couple of Second Empire houses, the Neo-Colonial J. W. Gerber home (1901), and some quasi-Queen Anne houses. The Maplewood Chapel (1895) is an excellent example of the Gothic Revival style. Most pre-1940 farm buildings are frame. Barns, granaries, corn cribs, and machine sheds are usually of wood construction. Modern farm buildings — metal sheds, corn drying bins, and silos — are scattered throughout the typical farmstead. One of the most striking features are the bright blue Harvestore silos rising above the windbreaks. Major investments in construction are reflected in the masonry buildings of the county. A few rare farmhouses are built of brick, like the Nuffer Farmhouse (1890). The P. J. Kniss house in Luverne (1879) is of brick Italian Villa style. The earliest substantial commercial buildings, built in the 1880s, were of brick. From the early 1890s to about 1905 locally quarried Sioux quartzite was used in commercial and community structures, and for an occasional house. Quartzite was quarried at several locations. The two largest operations were at Blue Mound, just north of Luverne, and in Jasper, at the Jasper Stone Company and Quarry (1890-present) in the northwestern corner of the county. Winchell noted in 1877 that the rocks "will serve as a building material, but are rather hard even for that, and it may be found more economical to bring in by railroad the building stones of the eastern counties." Little outside stone was imported; the First National Bank of Beaver Creek (1917) is one example. Local quartzite was used as a building material, but its use stopped in the first decade of the 20th century. Buildings of quartzite include the R. B. Hinkly house (1892), the Rock County Courthouse (1887-1890), and Holy Trinity Church (1891). Brick construction has continued to the present. Commercial districts vary from town to town. Many of the smaller town's Main Streets have mixed frame and masonry construction; the bank is often brick or stone and the other buildings are frame. Fire has destroyed many frame structures. The unfilled spaces leave major gaps in streetscapes. Luverne is the only town with a fully-developed Main Street commercial district. Most buildings are two-story, masonry construction. Dates of construction vary widely, and street level facades have been drastically altered. Rock County's historical significance is based on its development as an agricultural county in the southwestern Minnesota prairies. Railroads, rural settlement, and town service centers are the key factors of this development. The railroad land grants included most of the odd-numbered sections in the county. Railroads sold their land or turned the sales operation over to land companies. The major speculator in southwest Minnesota lands was the Close Brothers Land Company. They eventually controlled nearly 150,000 acres of land in five counties. The Close Brothers Tenant House (1883) represents the role of the developer of railroad lands in promoting county settlement. Several railroad officers and directors gained personal control over large acreages of railroad land. The Rock County Farming Company (1876), an incorporated operation of Horace Thompson, Russell Blakeley, and E. F. Warner, St, Paul capitalists associated with the Sioux City and St. Paul Railroad, was one of the largest bonanza farms in the state. Railroads functioned as important transportation links. The Worthington and Sioux Falls line reached the county first and built the W & S F Freight Depot (1876). In 1913 the same line, then part of the Omaha line, built the combination freight-and-passenger Omaha Depot just across the tracks from the freight depot. Together these depots represent rail transportation in the county. Homesteaders settled most of the non-railroad lands. The Nuffer Farmstead (1880) is owned by descendents of that farm's homesteader, Jacob Frederick Nuffer. The farmstead has evolved over the years and reflects changes from the 1890 farmhouse to the 1978 machine shed. Towns completed the settlement network. Here were the centers of commerce, industry, religion, and education. 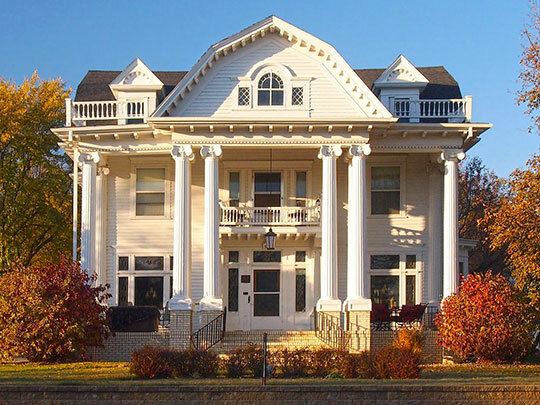 The Kniss House (1879) is a high point in Rock County architectural style. Kniss, one of the first settlers, platted the townsite of Luverne and was the leading entrepreneur of the county. Banks, perhaps the most important structures in the smaller towns, often purchased the choicest commercial lots. They are usually the most significant building on Main Street. The First National Bank of Beaver Creek (1917) is the best example in the county. Town merchants were often well-to-do in the county context, and their residences reflect their affluence, for example the J. W. Gerber House (1901) built by a hardware dealer. The Kenneth School (1901) and the Carnegie Library (1904) represent education in Rock County. Most rural schools have been razed. The Kenneth School, located in a small town, is the only remaining two-story frame schoolhouse. The Carnegie Library reflects some of Rock County's ties to the rest of the country. Two buildings associated with religious activity are included in the nomination: Holy Trinity Church (1891) and Maplewood Chapel (1895). Both have architectural merit in addition to their community significance. Small town theaters often epitomize "Main Street." The Palace Theater (1915) still functions as a movie house. The interior design is particularly notable. Federal Writers' Project, Minnesota: A Guide to the State, American Guide Series, Viking Press, New York, 1938. Interstate Publishing Company, Plat Book of Rock County, Minnesota, Boston and Chicago, 1886. Ogle, George A. and Company, Standard Atlas of Rock County, Minnesota, Chicago, 1914. Prosser, Richard S., Rails to the North Star, Dillon Press, Minneapolis, 1966. Reed, James P., "The Role of an English Land Company in the Settlement of Northwestern Iowa and Southwestern Minnesota: A Study in Historical Geography," unpublished M. A. thesis, University of Nebraska at Omaha, 1974. Rose, Arthur P., An Illustrated History of the Counties of Rock and Pipestone, Minnesota, Northern History Publishing Company, Luverne, Minnesota, 1911. St. Paul and Sioux City Railroad Company, Land of Promise, St. Paul, Minnesota, 1880. Van der Zee, Jacob. The British in Iowa, State Historical Society of Iowa, Iowa City, 1922. Winchell, N.H., "The geology of Rock and Pipestone Counties," in Geological and Natural History Survey of Minnesota, 6th Annual Report, Judson, Smith, and Harrison, Minneapolis, 1878. Harvey, Thomas, Minnesota Historical Society, Rock County Multiple Resource Area, nomination document, 1978, National Park Service, National Register of Historic Places, Washington, D.C.